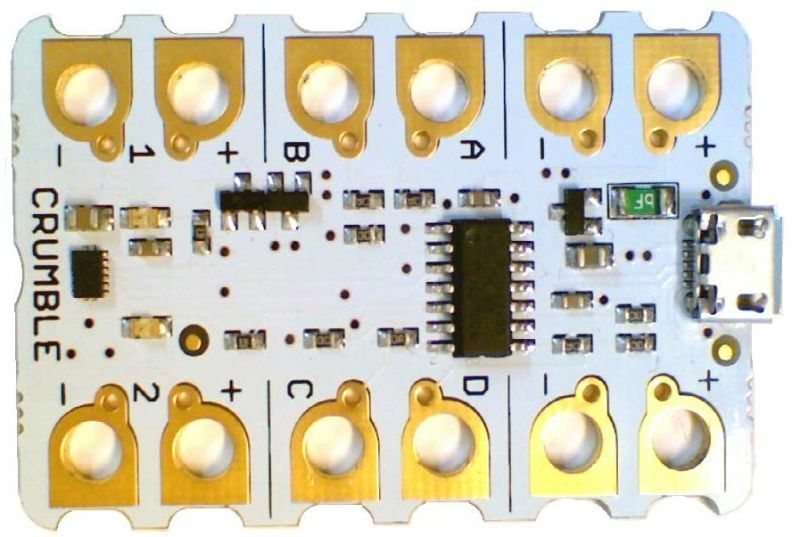 The Crumble controller is a tiny circuit board, only 33 x 52mm that allows young children (and their teachers) to quickly and very easily learn coding and some simple electronics. 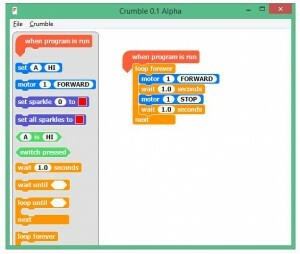 Physically, the Crumble is connected to other components using crocodile leads (“croc clips”), whilst in the software (which runs on a PC and Mac – Linux is coming soon) everything is done visually using drag and drop or simple clicks for selections. Simple drag the elements you want onto the stage, click on the selections (eg On and Off, Motor1 or Motor2) and press Go. The program is sent directly via USB to the Crumble and starts to run immediately. Even better, the Crumble never forgets its program, so you can power it back up next day or even next year and it will start running the last program downloaded to it. The hardware is designed very cleverly so the 4 connections labelled A, B, C and D can be either Inputs or Outputs and they will automatically change based on what you use them for in the program. No need to worry younger children with setting things up first, Crumble just works out what they want to do and does it directly. 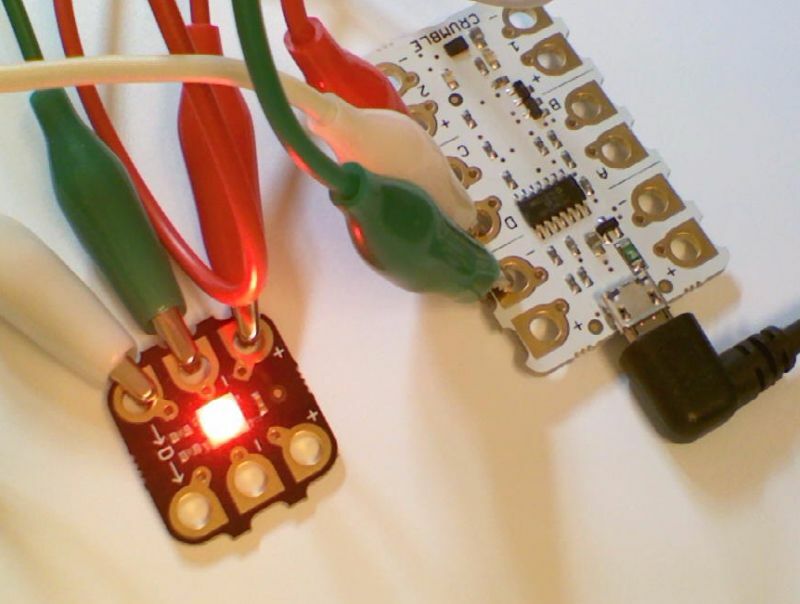 You can connect the Crumble outputs (A, B, C and D) directly to LEDs to turn them on and off. 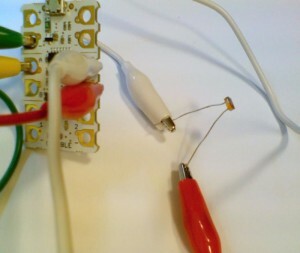 Remember the LEDs only work in one direction, so make sure you connect the long lead (positive) to the output terminal and the shorter lead (negative) to the ground terminal (-). You won’t damage anything by putting it the wrong way round, it just won’t operate. Setting output A to HI, switches on the LED. Setting to LO switches the LED off. How simple is that? Now extend this by connecting different colour LEDs to the different outputs (B, C and D) and see if you can make a traffic light sequence! 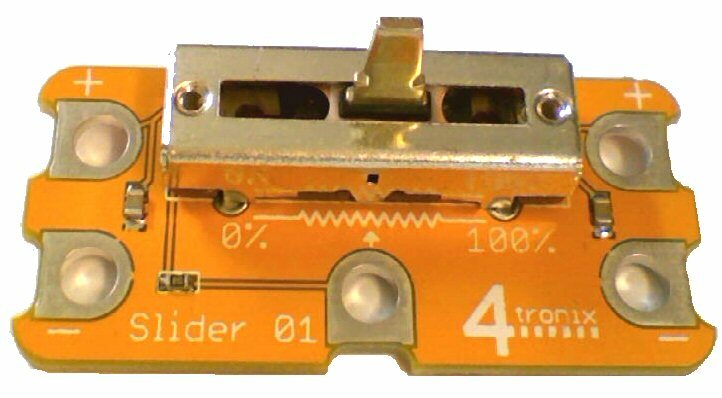 In the 4tronix standard starter kit we include an LDR (Light Dependent Resistor) which is an analog input device. For this to operate, one end (it doesn’t matter which end) is connected to a positive output and the other end goes to the input. For the positive output you can use one of the (A, B, C, D) terminals – or the 5V (+) terminal if you have power connected from a battery pack. Note that the + terminal is not powered from the USB input, only from a separate battery pack. Here red and white croc clips are connected between C, D and the two leads on the LDR. The yellow and green croc clips are still connected to the blue LED from the example above. The following program uses the analog values (between 0 and 255 remember) to set the delays in the flashing loop. The smaller the number, the faster the LED flashes. The number is smallest when the LDR is darkest – higher numbers for brighter lights. The first command is to set output D to HI. This provides the positive signal for the LDR. Note that we have used the “wait … milliseconds” block instead of “wait … seconds”. Waiting 255 seconds between flashes might be too long! The time to wait between flashing HI and flashing LO is simply the analog value of the LDR. The brighter the light, the bigger the analog value and the longer the flashes. Sparkles are individual RGB (Red, Green, Blue) LEDs that can be connecting in a long chain (up to 32 with the current software) and each can be set to a different value. These are also known as “neopixels”. Sparkles require a 5V power connection which can be from the + terminal on the Crumble (if a battery pack is connected) or from one of the A, B, C outputs set to HI. If using one of the A, B, C outputs then you can only use 1 or 2 Sparkles as they cannot provide enough power for more. You can flash the Sparkles using a simple loop as shown above. Notice the first statement sets C to HI to provide power for the Sparkle. We only have one Sparkle in our chain, so this is Sparkle 0. You can select any colour you like for each Sparkle just by clicking on the coloured square. In our Super and Ultimate Crumble kits, we also include DC motors. Again, these can be driven directly by the Crumble, but you must have a battery pack connected for these to work. The mootors use Pulse Width Modulation (PWM) to adjust the speed. Instead of changing the voltage driving the motors, the amount of time that the motor is powered is varied. If it is powered 100% of the time it will go at full speed, but if only powered 50% of the time it will go about half speed (actually, it isn’t quite that, but close enough). So connect one side of the motor to the motor + terminal on the Crumble (eg. Motor 1) and the other side of the motor to the motor – terminal as shown. In the software, you can read analog inputs using the method. 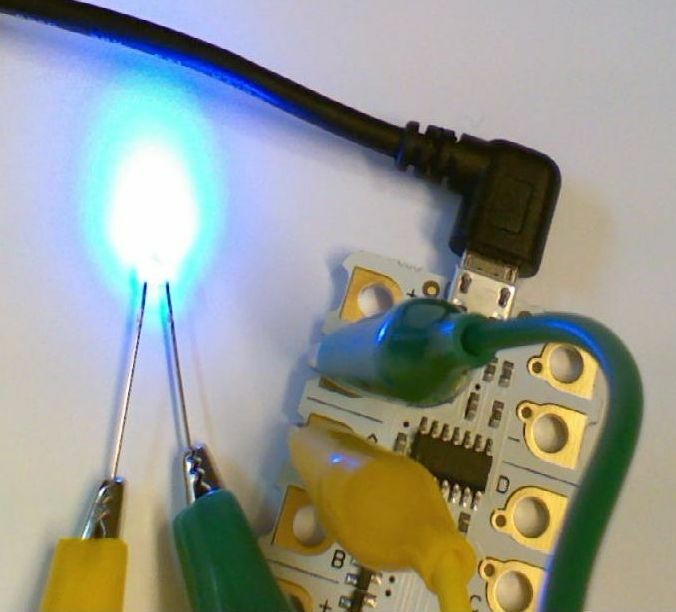 This gives a number from 0 to 255 that you can use to set the brightness of Sparkles, the speed of a motor or the rate of flashing of LEDs for example. Previous Previous post: iBoost64 – What is It?